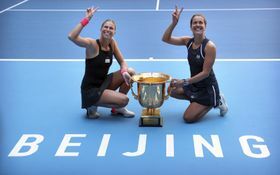 Andrea Sestini Hlaváčková, Barbora Strýcová, photo: ČTK/AP/Mark Schiefelbein In women’s tennis, No.2 seeds Andrea Sestini Hlaváčková and Barbora Strýcová rallied on Sunday at the China Open to win their second title of the season. They came from a set down to defeat No.3 seeds Gabriela Dabrowski and Xu Yi-fan, 4:6, 6:4, 10:8. After a rough start, the Czech duo found their rhythm in the second set, playing off each other’s strengths to take control of the match. Key to it all was their swift court coverage and finding their groove to reduce unforced errors. All five of the Czech pair’s finals this year have come at Premier level – or better – but Sunday’s victory in Beijing is their biggest title together as a duo. 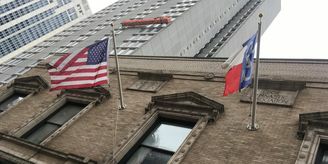 They previously triumphed at the Connecticut Open in New Haven prior to the US Open. Meanwhile Karolina Plíšková, who was eliminated in the third round of the Beijing tournament, has risen a notch in the world ranking to No.6. while her compatriot Petra Kvitova, who lost in the first round of the China Open has dropped four places to No.7. Jaroslav Šilhavý, photo: Filip Jandourek / Czech Radio Newly named Czech national football team coach Jaroslav Šilhavý will make his premiere in that role this Saturday (October 13) in the Champions League against Slovakia, in Trnava. Three days later, the Czech footballers will take on Ukraine, in Kharkov. 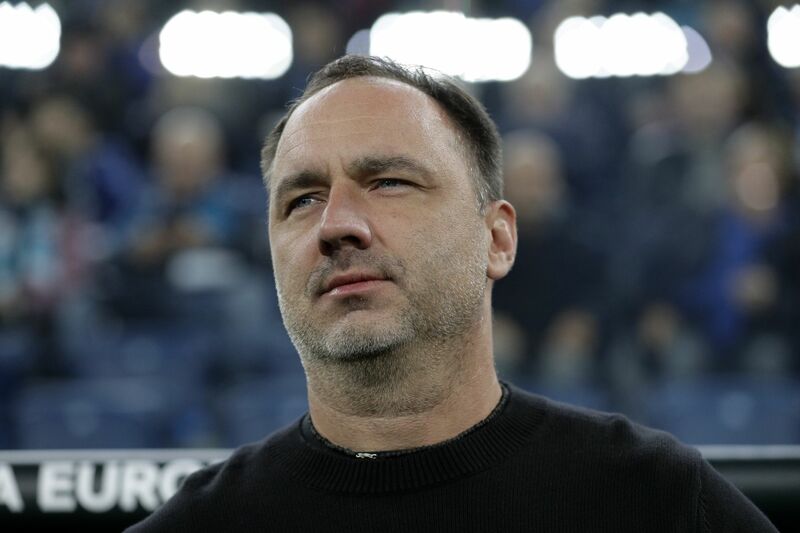 Šilhavý has not shaken up the squad much, at least not yet. But a few players not seen in a while will be taking to the pitch -- midfielder David Pavelka and defenders Lukáš Hejd and Ondřej Čelůstka. Also returning are Matěj Vydra, Josef Šural and Bořek Dočkal, among others. Jindřich Trpišovský, photo: ČTK/AP/Dmitri Lovetsky Slavia Prague continue to lead the Czech football league after a 4:1 victory at home over FK Příbram. However, goal difference is still the only thing separating them from second place Viktoria Plzeň, who beat Teplice 1:0, also at home. 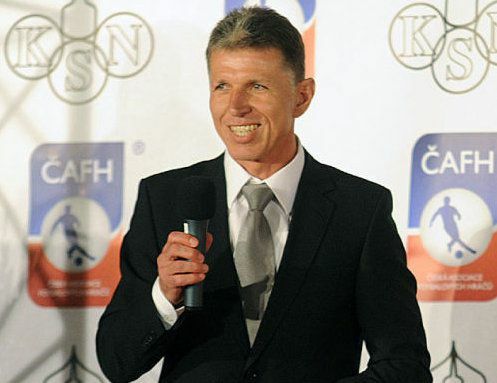 Despite the clear result, Slavia’s coach, Jindřich Trpišovský, saw it as a close game and praised the Příbram team, when he analysed the game for the team’s online television, Slavia TV. 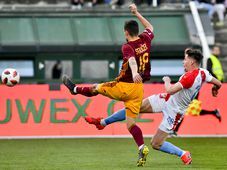 Meanwhile Sparta Prague, which is placed third, lost to Sigma Olomouc and is now trailing the leaders by four points. VERVA Litvínov - Mountfield Hradec Králové, photo: ČTK/Ondřej Hájek VERVA Litvínov is back in first place in the Czech ice hockey league after playing at home against the previous number one team, Mountfield Hradec Králové, which Litvínov beat 2:1. Although the two teams now both have 20 points, Litvínov has a better goal difference and has played one game less that Hradec. Meanwhile Orli Znojmo, which is so far having an unsuccessful season in the Austiran Hockey League, not having won a single game, lost 5:2 on Sunday, playing against Hungarian team, Székesfehérvár. The game involved a controversial moment, where the referees approved a goal by Székesfehérvár defender Bence Stipsicz, despite the video replay clearly showing the puck bounce away from the post. 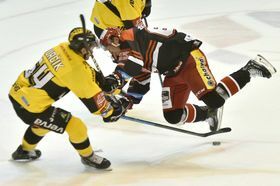 Petr Mrázek (right), photo: ČTK/AP/Karl B DeBlaker The regular season of the National Hockey League is underway, and a number of Czech players have been making headlines. The premiere point in the competition was scored by Martin Nečas, a 19-year-old rookie striker who plays for the Carolina Hurricanes. 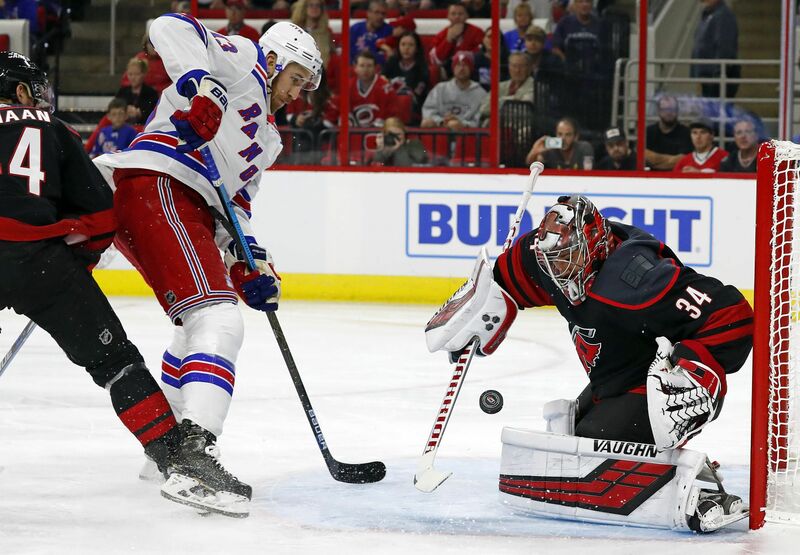 The goalie for the team, Petr Mrázek made an incredible 19 saves in Sunday’s wild match against the New York Rangers., and the Hurricanes went on to win 8- 5. Before heading to North America, Mrázek played in the Czech Extraliga, where he appeared for HC Vítkovice Steel during the 2007–08 post-season. 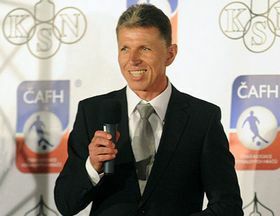 Nečas made his professional debut in 2016 while still a minor, with HC Kometa Brno, which won the league championship that year.